Post Hill Press, 9781618688446, 176pp. The Alpha Female's Guide to Men and Marriage shows women who have a dominating personality how to love a man. America is in love with the alpha female. She’s the quintessential modern woman—assertive, razor sharp, and fully in control. Her success in the marketplace is undeniable, a downright boon to society. But what happens when the alpha female gets married? An alpha wife is in charge of everything and everyone. She is, quite simply, the Boss. The problem is, no man wants a boss for a wife. That type of relationship may work for a spell, but it will eventually come crashing down. Since 1970, just as women became more and more powerful outside the home—more alpha—the divorce rate has quadrupled. And it is women who lead the charge. Today, 70% of divorce is initiated by wives. Do men just make lousy husbands? Not at that rate, says Suzanne Venker, bestselling author of The War on Men. The truth is that women don’t know how to be wives. Why would they? That’s not what they were raised to become. But women can learn. There’s an art to loving a man, says Venker, and any woman can master it. An alpha female herself, Venker learned how to be a wife the hard way—through trial and error. Lots of error. And here’s what she knows today—the set of skills a woman needs to pursue a career, or even to raise children, is the exact set of skills that will mess up her marriage but good. No man likes to be told what to do. And no woman respects the man who does. The Alpha Female's Guide to Men and Marriage gives women who are used to being in charge the tools they need to make their marriages less competitive and more complementary. Part memoir, part advice, this brave manifesto argues that while marriage is more challenging for the alpha female, it is possible to find peace in your marriage. In fact, it may be easier than you think. SUZANNE VENKER is an author, speaker, and nationally recognized expert on America’s current gender war. She’s a Fox news contributor and a columnist at PJ Media. Suzanne’s bestselling e-book, The War on Men, was fashioned from her article of the same name that became the #1 op-ed in Fox News history. The result was a barrage of media backlash and an appearance on The View, where Suzanne enjoyed friendly banter with guest host Mike Tyson while fielding attacks from Whoopi and Joy. 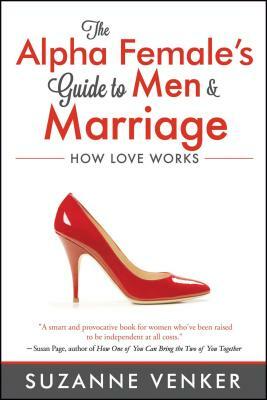 Suzanne’s most recent book, The Alpha Female’s Guide to Men and Marriage: HOW LOVE WORKS (February 2017), helps women with domineering personalities learn how to love a man. Her other books include The Two-Income Trap, How to Choose a Husband, and The Flipside of Feminism. Suzanne has written for many publications including Time, Parents, New York Post, and the St. Louis Post-Dispatch. She has also been featured in The Wall Street Journal as well as Newsweek, The Atlantic, The Economist, The Huffington Post, and London’s Daily Mail. Suzanne’s TV credits include The View, Fox & Friends, ABC News, CNN, C-Span’s Book TV, and more. She has appeared on hundreds of radio shows throughout the country, and her work has been featured on The Dr. Laura Program, The Late Show with Stephen Colbert, and The Rush Limbaugh Show. Suzanne graduated from Boston University in 1986. Today she lives in St. Louis, Missouri, with her husband of 18 years and their two teenagers.